"Brilliant ruby. Fresh and energetic on the nose, displaying fresh raspberry, cherry and spicecake aromas and a hint of smoky minerals. Palate-staining red fruit and floral pastille flavors are lifted and sharpened by a suggestion of white pepper. Smoothly plays depth off vivacity and finishes impressively long and pure, leaving a sweet red berry note behind." 2015 Lucien Lardy Beaujolais-Villages Blanc $13.99 - 100% Chardonnay from vineyards around Fleurie and Morgon. Native yeast ferment - all stainless steel. Lovely pale straw colour, surging aromas of pears, apples and a hint of citrus. Finesse and delicacy on the palate, the defining flavors of a Chardonnay entirely untouched by oak. 2016 Domaine Gerbeaux Mâcon-Villages $17.99 - Only about 200 cases (all biodynamically grown) made from young vines. Clean, fresh and nervy Chardonnay. Domaine des Gerbeaux is a small estate created in 1896 by Jean-Michel Drouin’s grandfather Jacques Charvet, thus the high end cuvee in his honor. Domaine des Gerbeaux was cre- ated by his son Xavier, the 5th generation of winemakers with- in the family. An estate of 17 acres located in the village of Solutre, dependent of the commune of Fuisse and the small village of Pouilly. The average age of the vines is between 35 and 45 years old with parcels as old as 90 years. 2016 Walter Scott "La Combe Verte" Pinot Noir, Willamette Valley $26.99 - For the 2016 vintage, La Combe Verte is composed primarily from Eola-Amity Hills sources, with barrels of Vojtilla and Freedom Hill Vineyards added in order to thoughtfully paint our unique picture of the Willamette Valley. This Pinot Noir is 15% whole cluster, fermented with ambient yeast, and aged in barrel for 10 months with 30% new oak barrels. The resulting wine is a serious and beautiful example of the 2016 vintage, layered with power and structure giving this wine immediate appeal, alongside the ability to be tucked into your cellar for several years. Layers of red cherries, plums & spicy earth fill the nose. The fruit, tannins and acid all come together to make the wine our version of the complete package. 2016 Hahn SLH Pinot Noir, Santa Lucia Highlands $22.99 - A perennial favorite and always a stellar value. Tasting NotesAromas of bright red cherry, strawberry with hints of earth, spices, and toasty oak. An explosion of red fruit including strawberry, cherry and raspberry welcome the palate finish with refined tannins and a soft mouthfeel. Winemaker NotesAfter the fruit has been carefully picked and sorted, it is fermented in open-top stainless steel tanks. We then age this Pinot Noir for up to 11 months in a selection of small, 60-gallon French oak barrels. When the wine is ready to be blended, our winemaker selects only those barrels that exemplify the aromas and flavors of the Santa Lucia Highlands. 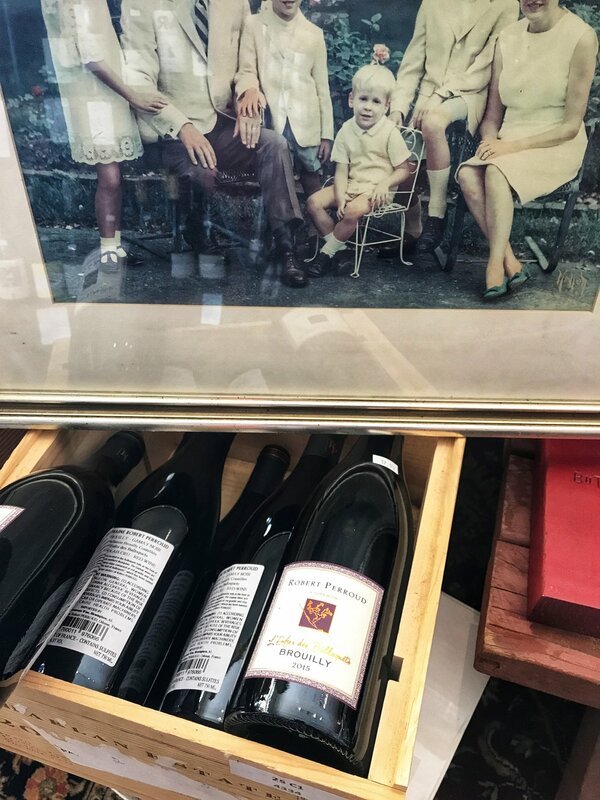 The tale behind this wine dates back to my first California trip with Daniel Brunier, owner and winemaker of Domaine Vieux Télégraphe, the Châteauneuf du Pape that many refer to as the most legendary wine of the southern Rhône. Daniel and I travel together frequently and he loves America and things American, including the wines of California. During a trip 15 years ago we spent a day traveling through the Central Valley. Daniel was amazed at the endless sea of vineyards, and was especially taken by what was obviously a significant amount of old vines. ‘You should find some old vineyards planted to historical southern Rhône varieties,’ he said, ‘And I’ll help you make a traditional Rhône-style wine from them.’ The search took several years, but it paid off when in 2007 Tadeo found a block of 130 year-old Carignan vines in Oakley. We had already discovered some Grenache from Borden Ranch, along with Mourvèdre from Sonoma County and Syrah from Santa Lucia Highlands. All four wines were made as separate varietals at our Sage Canyon winery, but when blended together we knew we had something special. The whole was far greater than the sum of its parts. One drawback, however, was that we had no opportunity to label the finished wine as a variety, or even as a regional blend, coming as it did from four separate regions in northern California. Instead we opted to name it after the location of our winery which is in the Sage Canyon area of the Napa Valley. The wine is a blend of four wines, each produced using the traditional Rhône process of ‘Pigeage’ where all of the grapes are crushed by foot, not by machine. Each wine ferments separately, and when complete we drain and press the tank, rack the new wine to used 60-gallon French oak barrels, then let the wine age on the lees for a year before blending. We then bottle, unfined and unfiltered. The finished wine is complex and old-worldly. There’s earth and mineral along with some wildly exotic fruit, and an attractive soft finish. We’ve regularly heard it referred to as the best example of an old-world blend made today in California. We think it’s at least that. A blend of 45% Carignan (vines are 140 years-old), 25% Grenache, 15% Mourvèdre and 15% Syrah. 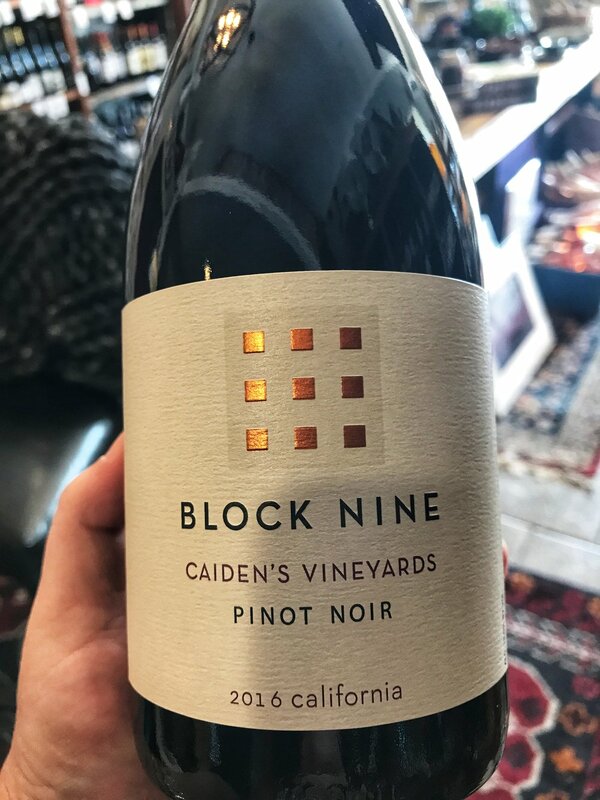 2016 Block Nine "Caiden's Vineyards" Pinot Noir, California - $12.99 The Caiden’s Vineyard Pinot Noir from Block Nine is reliably one of the best value California Pinots available, year in, year out. The quality comes as no surprise when you understand that this wine comes from a producer that makes only Pinot Noir. The varietal receives undivided attention, and the result is exceptional small-production Pinot. The 2016, the result of a long growing season with consistent temperature, is beautifully long, rich in ripe cherry and berry flavours. Aged entirely in French oak, the nose shows generous bright fruit, with strawberry, violets, plum, tea, and a hint of clove. Lifted and silky on the palate with good body, notes of wild cherry and sandalwood round out the finish. This is proving to be a terrific vintage.